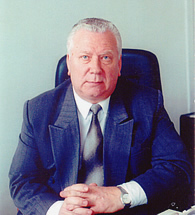 Professor Mykola Tronko was appointed director of the State Institution V. P. Komisarenko Institute of Endocrinology and Metabolism, National Academy of Medical Sciences of Ukraine, one month before the Chernobyl accident, in March 1986. Since his appointment he has been consistently involved in investigating the effects of the accident on the thyroids of the inhabitants of the area, and conducting medical examinations. In 1995 he reported the increasing number of cases of pediatric thyroid cancer in Ukraine in Nature magazine, earning attention from around the world. Professor Tronko has for a long time promoted joint research with Nagasaki University, and been involved in the pursuit of joint research into radiation-induced thyroid cancer ever since visiting Nagasaki in November 1991 as a member of the Ministry of Foreign Affairs' Expert Council on Chernobyl. He was involved in the conclusion of an academic agreement exchange between his Institute and Nagasaki University in 2003, and has devoted his energies to further joint research and interaction between personnel.